Daryl Hannah couldn’t make a basket before shooting her most recent project. She had the height and was always athletic. Yet the skill eluded her, but after “Hot Flashes” now she knows. Acquiring a new skill here and there is part of the actor’s trade, but somehow hearing Hannah talk about these extra elements make me think that it might be rare that people get to do it in general. 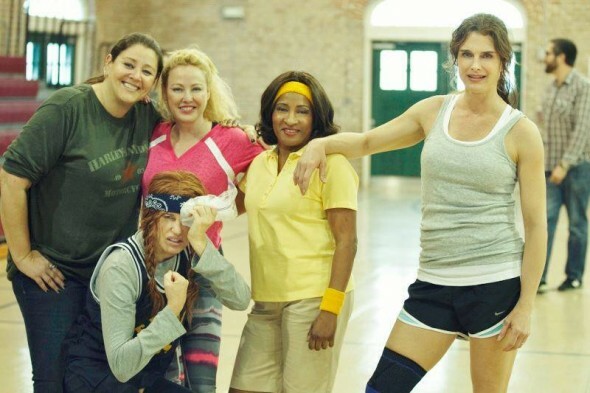 In this case the cast of the new comedy “Hot Flashes”, Brooke Shields, Hannah, Wanda Sykes, Virginia Madsen, Camryn Manheim, were put through a crash course with Michael Cooper from The LA Lakers and staff from the USC Women’s Basketball team. The small town story concerns a group of middle-aged women who challenge the high school state championship team in a game that will raise money for a bankrupt mammogram unit. The issue of lesser health care opportunities in rural areas is a subject Hannah mentions when praising the script by Brad Hennig. Interestingly another movie she did in the South, “Steel Magnolias,” was a film about a group of tight knit women also written by a man, Robert Harling. Hannah mentions how odd it is that you don’t see many movies where a group of females are at the center of a film. Given the chance, she says it was a “no brainer” to work with this cast and take on the role of Ginger, a closeted lesbian who everyone in the town already knows is gay. In learning basketball or stepping into a conflicted woman’s mind, the will and openness to experience becomes a quiet source of confidence. Its presence lies behind Hannah’s shy public demeanor during interviews (“it’s not a goal of mine to be a celebrity. It’s kind of anathema to me. I’m shy”). The confidence may come out in a bold and unforgettable villain turn like in “Kill Bill I and II” or in the passion with which she pursues environmental activism, some of which recorded at her Web site dhlovelife.com. She has produced the web videos on her Web site herself with the help of a editor and says that along with singing or making music the web work “keeps me alive.” Certainly it takes an experiential nature to describe the new comedy “Hot Flashes” the way Hannah does. Hannah connects the plot of the film to a documentary her friend made on happiness. She says that when an individual sees a chance to do something for others, and does it, then happiness follows. Hannah is often known for her memorable work in the 80s, for example her turn as a mysterious mermaid in the Tom Hanks romantic comedy “Splash.” But these days it’s the activism or finding a new interesting role that interests Hannah, rather than sticking to the type of role that allowed her career to blossom. Switching modes was part of the role that many called a comeback for Hannah, the vicious, eye patch wearing Elle Driver in “Kill Bill I and II”. It’s why she fondly remembers working with Quentin Tarantino. Hannah laughed. “That’s assuming I have a type! That’s what happens when you’re successful at one thing, they’ll squeeze more money from that stone. But as an actor that’s what you want. You don’t want to have to repeat yourself over and over. Since I had been successful in romantic comedies where I played the vulnerable lead, people assume that’s what I did. I really relished the opportunity to play such a tough character with almost no vulnerability, no soft side. It was so much fun. It was delicious. And working with a director who could make a set come alive also appealed to Hannah. Hannah’s career is a testament to how far and interesting a journey can be from an unusual childhood. From kindergarten through 12th grade she has said she was “brutally picked on” in school. Intensely shy and introverted (with signs of Asperger’s) Hannah would often turn inward and get lost in her own fictions. Meanwhile her mother remarried to a businessman Jerrold Wexler (brother to “Days of Heaven” co-cinematographer Haskell Wexler), perhaps opening up the idea of film as a possibility. After college at USC she caught breaks in the films of Brian DePalma (“The Fury”) and Ridley Scott (“Bladerunner”). The outlet to create characters was a natural find for the creative young actress. Flash forward to one of the lesser known moments of Hannah’s career and the will behind the mild-mannered actress who’s quick to laugh shows itself. She played a part in a film called “Dancing at the Blue Iguana,” a story about different strippers, an experimental film with no script where the actors had to provide their own characters and backstories. Hannah had never been in a club. In searching for documentaries about strippers she found “there wasn’t any!” At least not in the cinema verite style she wanted to see. So she visited the working girls and later picked up a camera to make the documentary herself. Talking about it now she laughs at her naivete, but wears the reward. Especially now that she plans for a new series of web episodes to film. Tagged Brad Hennig, Brooke Shields, Camryn Manheim, Daryl Hannah, documentary, film, Hot Flashes, Kill Bill, Michael Cooper, movie, OK, OKC, Quentin Tarantino, Steel Magnolias, Virginia Madsen. Bookmark the permalink. Great review. It definitely makes me want to see the film, And perhaps to meet Daryl Hannah.